Jazz up the holidays with our Yuletide Dog Jumper, perfect for Christmas pictures! 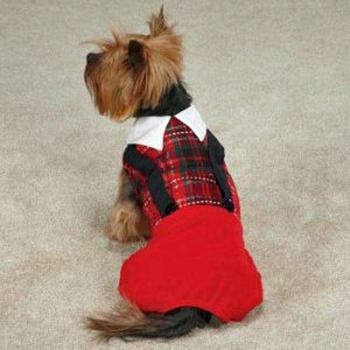 This adorable outfit for dogs sports a silvery tartan body with red velvet bottom and black suspenders with real buttons. Machine-washable. Chest/Girth: Measure girth around the broadest part of the chest and add 2"